Let's demystify the northern lights, go out and about and watch for yourselves the greatest show of them all. What's the perfect time to witness the northern light you may wonder. Basically you could spot the phenomenon the year round, but during the lighter months you'll need special tech equipment. During the winter months, especially in the beginning of the year the nights can be ice cold. But on the other hand you may add dog sledding, skiing and other wintry activites to your agenda daytime. If you prefer a little warmer temperature the autumn months of September and October would be just about right. Pack warm clothes, proper shoes, camera and a decent amount of patience, and you'll be ready for adventure. Stay convenient at one of our hotels up north, in Sweden, Norway or Finland, well suited for your mission - the Aurora Borealis hunting. Unique adventure hotel on the quayside in Bodo. Experience activities and attractions you'll never forget. Enjoy stunning views and delicious food in Roast Restaurant. Stay near the sea in the centre of Bodø. 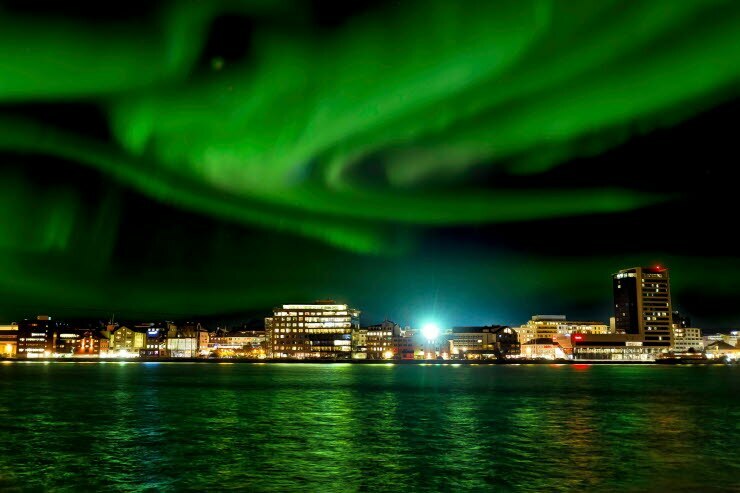 Experience the midnight sun, northern lights and beautiful nature. Perfect for meetings, only minutes away from the airport. A central hotel with wonderful views. Beautiful nature and exciting things to do right on your doorstep. Experience sea fishing, Sami culture and natural adventures you will never forget. Welcome to Scandic Ishavshotel, the hotel that won the award for the county's best hotel breakfast in 2017! Stay right by the quayside in the centre of Tromso and wake up to views over the sea, Ishavskatedralen church and Tromsdalen valley. Ideal for both family holidays and conferences. Stay in the city centre with the airport shuttle bus on your doorstep. An ideal base for a day full of fun which you can complete with some dancing at Gründer by night. Stay centrally in the city, only a few minutes from the airport, the harbour and the bus station. Enjoy the views over Varangerfjorden from your window, and experience Vadso at its best. Stay in the idyllic city centre. You can hold a conference for up to 450 people here, and set out on an expedition to explore the exciting landscape.